Whether you’re going to the park or for a long road trip, traveling safely with your dog is an important part of being a dog owner. Have you ever thought about what your dog needs when you leave the house together? Here are a few tips for being prepared for any trip. Unless your dog has had leash training, she may not know how to behave on her leash when you’re in unfamiliar places. Our elite obedience training classes teach your pup to be on her best behavior no matter where you go, especially if she’s on a leash. Remember, wearing a leash is important for your dog’s safety. When she hops out of your car, she needs to be leashed so that she can’t get beyond your control in case she’s startled by unfamiliar noises or situations. Although it isn’t recommended, some dog owners choose to let their dog roam freely throughout the vehicle while it’s in motion. This creates safety concerns for both you and your dog. 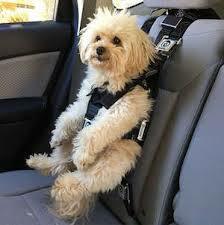 At KC Dawgz we believe in securing your pup so that everyone in the vehicle travels safely. Many different pet-brands offer dog slings, which slide over seat-belts to protect your dog, and backseat covers, which protect your car’s interior. Some dog owners elect to have their dog stay in a travel kennel during a trip, which is another safe option. On longer trips, be sure that both you and your dog have food and water for the trip to avoid fatigue. You don’t want to end up having to share your sandwich with your hungry pup! Try to keep the same feeding schedule on the road that you do at home. Just bring the same amount of food that you need for your dog in a reusable container, then plan to take a break around the same time that you’d feed your dog at home. Having enough water to drink is just as important. Whenever you stop for a break, make sure you give your dog a chance for a walk and a drink. Keeping a water bowl and a bottle of water in the car will make this easy for both of you. Be sure that your destination allows dogs. It could be a great disappointment to you and your dog if you arrive and are unable to stay because they don’t allow dogs. Most rest areas along the highway have dog-friendly areas, but be sure to check with hotels before setting off on your journey. Regardless of whether you’re crossing state lines or just going up the street, enjoy the time you’re planning to spend with your furry friend by following these travel tips!